Electric Gardens has announced the line-up, venues and dates for an electrifying festival tour landing in Sydney, Melbourne, Perth and Adelaide in January 2019. Up to 50,000 electronic music fans across Australia will be able to experience the very best local and international artists from the scene courtesy of T1000 Events, with dance music royalty, Underworld, leading the charge. Recognised as one of the greatest live acts of all-time, Karl Hyde and Rick Smith will be banging out their repertoire of goose-bump inducing anthems including 'Born Slippy', 'Two Months Off' and 'Always Loved a Film'. No strangers to headlining the world's greatest festivals and events, their contribution to the music industry is unparalleled having been handpicked by Danny Boyle to soundtrack the biggest festival of all - the 2012 London Olympics Opening Ceremony. Karl Hyde, Underworld comments: "The energy Down Under is second to none, we're excited about our return and we'll be taking everyone on a journey at each and every one of the shows." Following his electrifying 2016 Electric Gardens performance, Erick Morillo, the platinum-selling artist and Subliminal Records head-honcho will be back with a bang in 2019. Igniting the party wherever he goes, the superstar DJ will be showing Australia exactly why he's still top of the game after more than 20 years in the biz, bringing the glitz and glamour of Miami, Ibiza and beyond to our shores. With tracks 'I Like To Move It, 'Believe', and 'I Feel Love' under his belt, the mix meister extraordinaire has remixed everyone from Whitney Houston to Basement Jaxx and has collaborated with Puff Daddy, Jamie Jones and Boy George alike. Next up is Aussie electronic duo Bag Raiders, who are headed homeward bound for their first series of live shows after an extended hiatus. With a new album poised for release in 2019, revellers will be able to enjoy a sneak preview of their latest floor-filling offering and celebrate 10 years since 'Shooting Stars' catapulted the boys to global stardom. Not content with releasing a new track every month throughout 2018, local legends, Set Mo, are starting 2019 as they mean to go on, promising punters an epic festival performance at Electric Gardens. Joining the lads on stage and completing the EG2019 touring party is an all-girl-line-up of live vocalists, Woodes, Asta and Thandi Phoenix - Set Mo collaborators past and present. Known for their marathon stints behind the decks as well as their game-changing productions, 'White Dress', 'I Belong Here' and 'Nightmares', Sydneysiders Nick Drabble and Stu Turner cite Booka Shade and Groove Armada as inspo for their varied sounds. 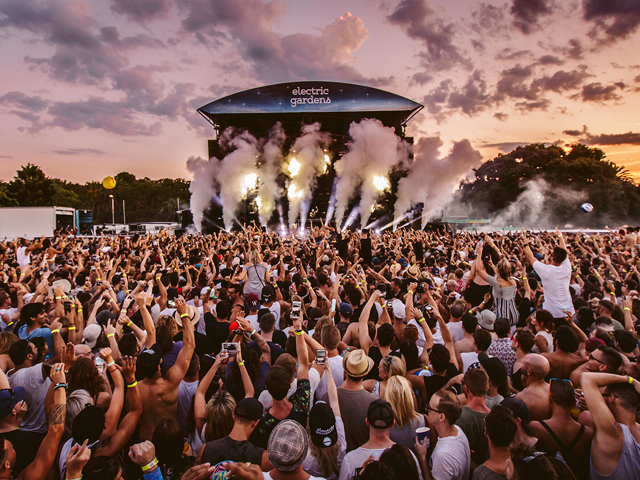 Damian Gelle, Promoter, Electric Gardens comments: "The 2019 events will be bigger and bolder than ever before, as we bring momentous sound, light and vision to these luscious green venues. We're pumped to be showcasing these world-class artists as part of a world-class production."